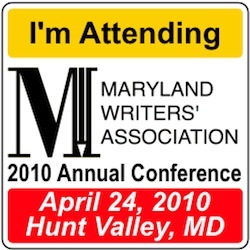 The Maryland Writer’s Association 2010 Annual Conference is in 3 weeks, and I’m signed up to attend. Roxana Robinson will be the keynote speaker, with 20 other distinguished speakers and panelists on the schedule. I’m looking forward to meeting other writers in the Mid-Atlantic area and learning a few things, too.